Real Asian Beauty: Now a contributor writer on MyKoreanBoyfriend.com! Now a contributor writer on MyKoreanBoyfriend.com! I've been wanting to be a contributor on her blog ever since she announced that her site is open for it. But at that time, I just couldn't think of right topics to contribute. Good thing K-pop is there. 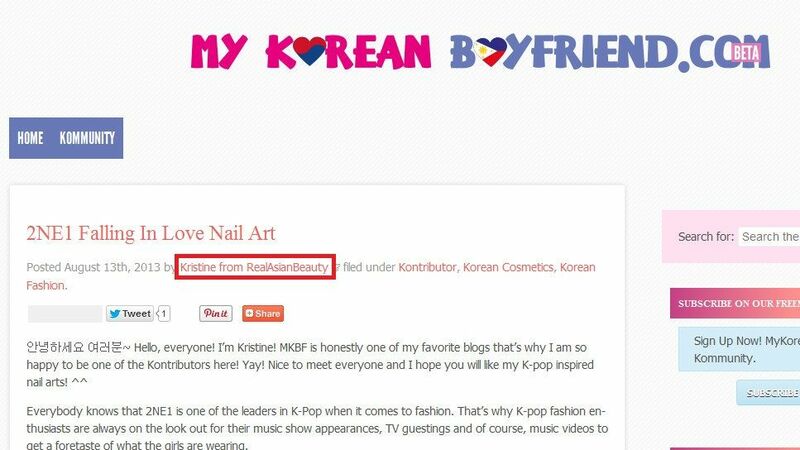 Now I can write and share about my K-pop nail arts and other beauty tips on her website! Yay! Can you see my name? Kristine! Yay! It really is me! I'm really happy about this so I hope you come and read my articles on her blog. CLICK HERE to go the the beauty and fashion section of her blog.